Pictured, from left, are Miranda Jordon, assistant vice-president, commercial documentation manager; and David Findlay, president and chief executive officer. 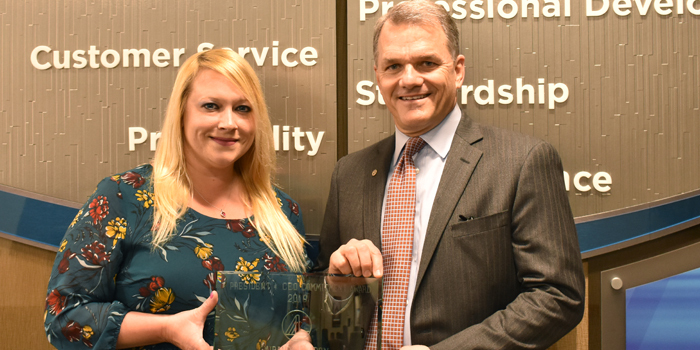 WARSAW — Lake City Bank presented the 2019 President and CEO Commitment Award at its quarterly officer meeting to Miranda R. Jordon, assistant vice-president, commercial documentation manager. Jordon, who has been with Lake City Bank for 15 years, oversees the commercial loan operations documentation team, including monitoring processes and procedures that maintain the accuracy of commercial loans. During the bank’s recent implementation of its new loan processing system, Jordon stepped forward to ensure that the project was a success, working on many aspects of the implementation effort that were above and beyond her operations role. While fully involved in the loan system project, she maintained a consistently high performance level in managing her group. She also attends Ivy Tech Community College and anticipated earning her business administration degree this year. Jordon volunteers teaching Money Smart classes, participated in offering reality stores at local schools, and works the VITA tax preparation program.